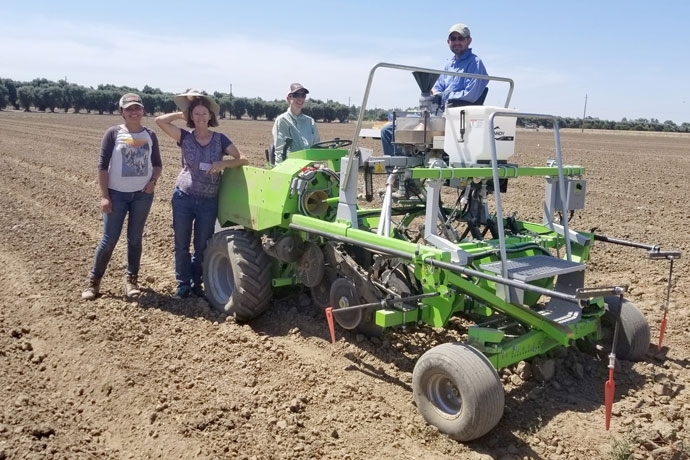 Rachael Long, Jasmin Bonilla, Antonia Palkovic, and Jorge Berny planting beans at UCD. Figure 1. Sclerotia of white mold disease. I was recently contacted by a Pest Control Advisor (PCA) regarding a lima bean field in the Tracy area. 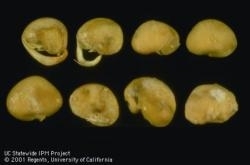 The plants were showing some unusual symptoms, and while the field was nearing harvest, the grower was hoping to get another couple weeks out of it for pod fill. 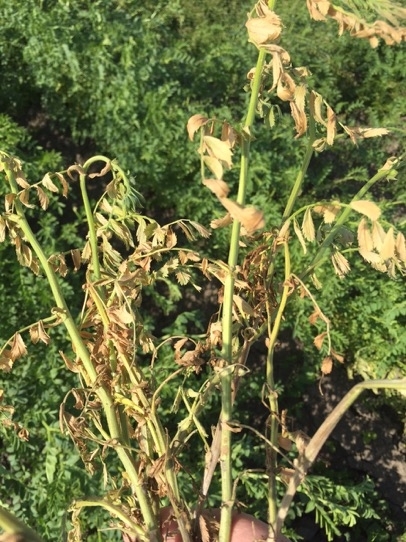 The PCA had already collected plant samples and sent them to a disease lab; the lab diagnosed the plants as having Sclerotinia sclerotiorum, or white mold. Inside the roots of those plants were hard, black sclerotia (Figure 1), which are compact masses of mycelium and characteristic of the disease. Figure 2. 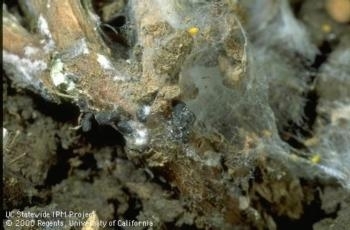 White mycelium of white mold. I later visited the field with the PCA in order to assess the situation for myself. The disease appeared to be most apparent in one corner of the field where the water tends to sit a little longer. 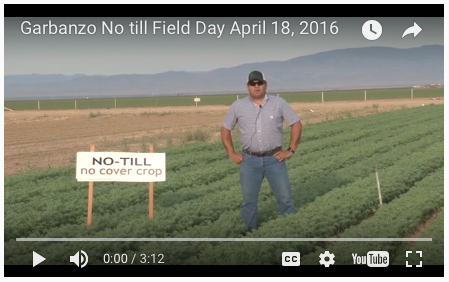 (This is a furrow irrigated field that has had beans for several consecutive years.) Moist or humid conditions favor white mold, as do heavy canopies. 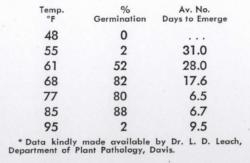 The leaves were showing some unusual brown lesions, and some plants had white mycelium growing on the pods (Figure 2). 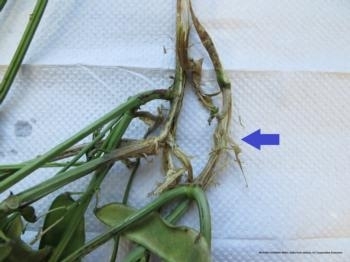 The most detrimental symptom that we observed, however, was complete infection of the stem at the soil line, causing the tissue to dry up (Figure 3). In this case, the upper canopy looked ok, but I am uncertain, perhaps doubtful that the pods will fill on these plants. What we can hope is that the disease won't appear on more plants in the next two weeks because there are really no management strategies at this stage in the game. 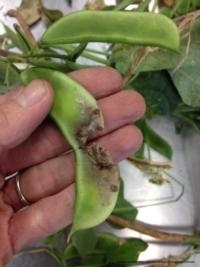 The grower needs to think about how to manage this disease in the future, and rotating out of beans to a non-host crop (like small grains or corn) is probably a good strategy. Figure 3. Stem die-back from white mold. 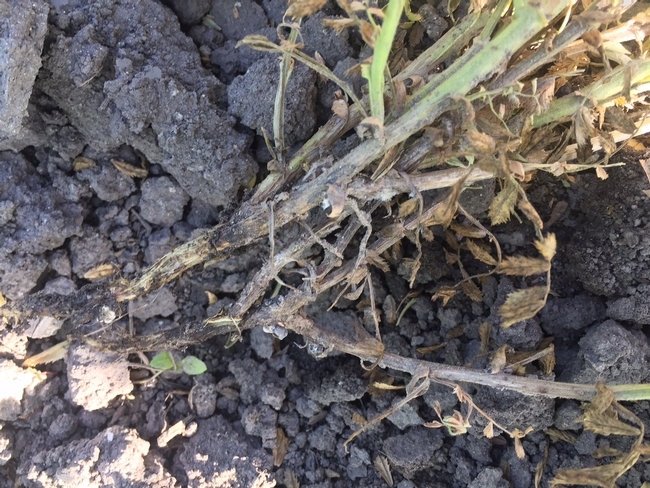 Weeds around the field can still harbor the disease, and the hard, black sclerotia can survive in the field for several years. If the grower plants beans again, then it is important not to over-apply nitrogen, which can result in an excessive canopy, limiting air movement. If wider row spacing is an option, this can also improve air movement in the canopy, which makes conditions less favorable for white mold. Monitoring for the disease should begin at flowering, which is also the best time to apply fungicides (like thiophanate methyl or boscalid) because the plants are small enough for the treatment to penetrate into the canopy.